At the very top end, you’re looking at €3601 for 290,000 Avios which is, in Sterling, £3188 and so exactly 1.1p per Avios. I am not a buyer at this level on a speculative basis and I would only buy if you have a definite plan for where to redeem. The ‘buy points’ page on iberia.com is here. You need to be logged in to see the offer. The richest route is the British Airways service from Heathrow to New York JFK which OAG estimates as being worth over $1 billion per year. Intriguingly, based on OAG’s pricing date, this is not the most lucrative by hour of flying time. That award goes to the Emirates service from Heathrow to Dubai which generates $25,000 per hour. 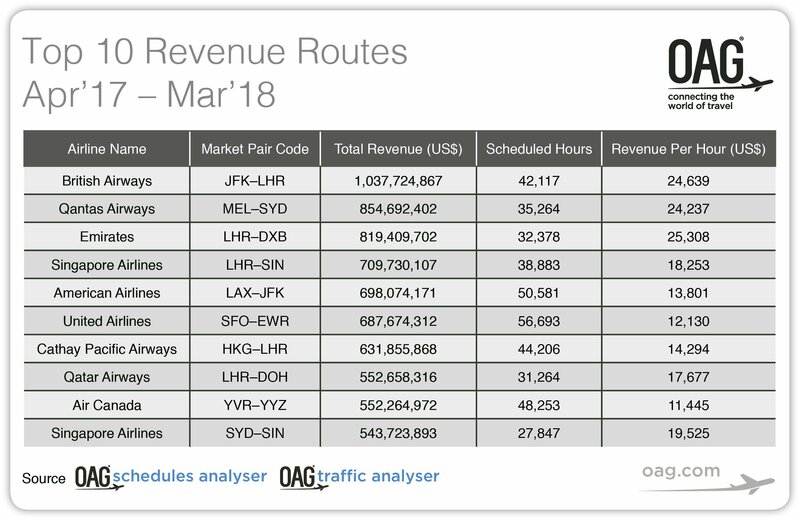 This is an ‘all A380’ route which is why the average revenue is so high. 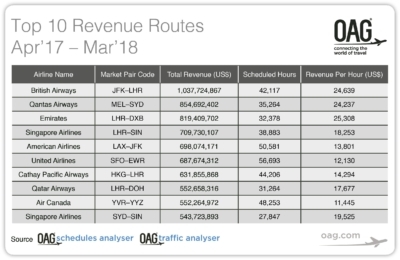 There are three other Heathrow routes on the top 10 list – the Singapore Airlines service to Singapore ($700m per year), Cathay Pacific to Hong Kong ($631m) and Qatar Airways to Doha ($552m). Singapore Airlines is the only airline to feature twice on the list, with Sydney coming in at 10th place. You can find out more on the OAG website here. 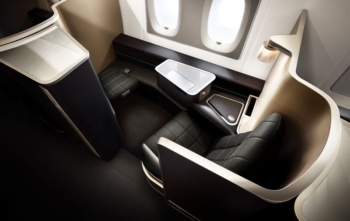 British Airways has brought back its regular ‘upgrade to First’ offer. Until 7th October, any Club World flight you purchase which is ticketed in semi-flexible R, D, or C class, or a fully flexible J class, will receive a free one-way upgrade to First. This is subject to availability and requires A class cash tickets to still be available for sale in First. The deal is also available on American Airlines services to the US, Canada and Mexico when you book under a British Airways codeshare. You need to book by 7th October for outbound travel before 23rd October. United States, Mexico and Canada – Albuquerque (ABQ), Anchorage (ANC), Atlanta (ATL), Austin (AUS), Bradley International (BDL), Birmingham (BHM), Nashville (BNA), Boston (BOS), Baltimore (BWI), Chicago (CHI), Cleveland (CLE), Charlotte (CLT), Cincinnati (CVG), Denver (DEN), Dallas Fort Worth (DFW), Detroit (DTT), Fort Wayne (FWA), Honolulu (HNL), Houston (HOU), Indianapolis (IND), Memphis (MEM), Mexico City (MEX), Miami (MIA), Minneapolis St Pauls (MSP), New Orleans (MSY), New York (NYC), Omaha (OMA), Philadelphia (PHL)), Pittsburgh (PIT), Raleigh Durham (RDU), Richmond (RIC), San Diego (SAN), San Juan (SJU), Salt Lake City (SLC), St Louis (STL), Washington (WAS), Montreal (YMQ), Toronto (YTO), Vancouver (YVR), Calgary (YYC). Full details are on ba.com here. I have an IB account which is around 6 months old; I successfully signed up for the 90k avios which are now in my account, but need to buy some avios at the discounted rate so I can transfer them to BA for a redemption to take advantage of a Amex 2-4-1. I obviously can’t transfer the 90k; will I definitely be okay to purchase the 15k I need to transfer to BA? In theory no but if you call You First they are more flexible than the main call centre. Thanks for that, and thanks for flagging up this deal Rob, great deal as for once no multiple positioning flights needed!! If I already have a club world ticket booked in an eligible class, can this be somehow upgraded to first? Thanks!